The Rufus Cuff is like something out of a science-fiction film. It's definitely not one of the slim and tiny smartwatches you're accustomed to seeing and using, nor does it pretend to be. Rather it's a device made for enterprise – but that doesn't mean the company has completely ruled out consumers. The Cuff saw a successful crowdfunding campaign and opened pre-orders earlier this year. Rufus Labs CEO Gabe Grifoni says that a good amount of people have already put in orders, which he thinks is a great sign of things to come. Grifoni believes wearables like the Cuff will eventually make smartphones obsolete. However, getting there may take a while, especially if the parts, comfort and design aren't up to speed with current mobile devices. That's what I found most concerning after my time with the Cuff. While a fascinating concept, I was left unsure if anyone would actually use it. 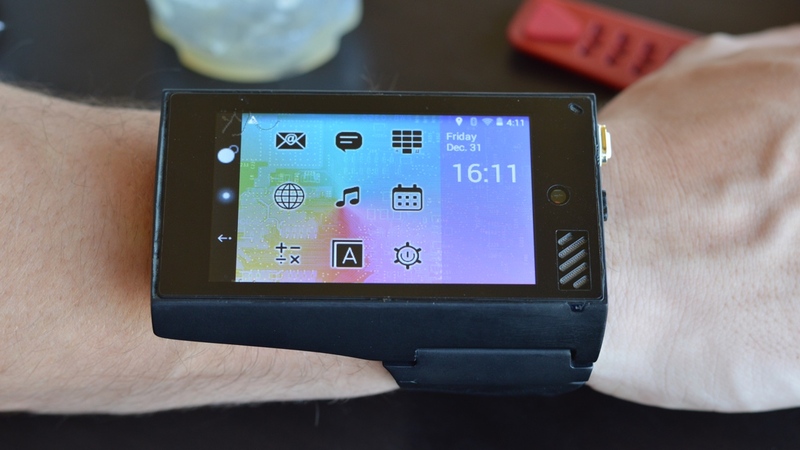 Basically, the Cuff is a 400 x 240 3.2-inch screen with a 640 x 480 front-facing camera, running a proprietary Android KitKat OS that's powered by a TI Cortex A9 Processor. I was told the operating system can be upgraded to Lollipop followed by Marshmallow. While the upgradable OS is promising, it's unfortunate that the Cuff wasn't built with Marshmallow to begin with. The interface at the moment looks like your average smartphone. It's intuitive but less zippy and drab on the screen. Aside from software, the most obvious head scratcher is the size and general design of the Cuff. Yes, it's a beast – but Grifoni says it was built that way so people wouldn't need to constantly pull out their phones. That's the premise behind wearables already but with Cuff, the size supposedly makes it even easier to watch videos, play games, check social media, take video calls and send messages. It's true that smartwatch screen real estate is limited, making it difficult to do much. Anything larger than the standard is cumbersome and doesn't make sense for everyday wear. That's why the Cuff is so divisive. I see the good intention, but perhaps 3.2-inches is too far? Easton Fier, Rufus Cuff's director of brand strategy, notes that on the consumer end, he sees people using it as a multitasking device – like in video games. The perfect example is Fallout 4's Pip-Boy, where users can check the Cuff as they would a Pip-Boy but in real life. It's definitely smaller than the wearable that came with the game and the one coming out soon but is still very niche. On the wrist, the Cuff takes up half of my small arm but Grifoni says there are different band notches to fit various sized wrists. The one I tried was an early prototype fitted with velcro and it actually sat well on my arm. However the placement of the band was too far off-centre and the majority of the Cuff body kept sliding around. The team has noticed this as well and moved the band slightly to help alleviate the wobbliness. The battery life is 12 hours, which is meant to match up with a long workday for the enterprise wearers. There's also 8GB of onboard storage and you can upgrade to 16GB, 32GB or 64GB for an additional cost. That means you can have plenty of apps, and even music (there's Bluetooth connectivity for headphones), if you want to try running or working out with the Cuff. The Rufus Cuff is a device for early adopters and doesn't seem like it's ready for much else yet – at least for consumers. It's reminiscent of the first Pebble watch where it worked and caught our attention but in the case of the Cuff, it needs many, many refinements before it can garner the cult status Pebble has cultivated. Providing an LTE-enabled wearable would have been the feature to help the Cuff stand out from all the tethered devices. But right now, it's just another phone dependent wearable that's frankly underpowered and oversized for the wrist. For the enterprise space, it makes a bit more sense. Having a hands-free device for work in a warehouse taking inventory or any job where you need to be looking at a screen could make the Cuff quite useful. Wi-Fi would also be fine since employees should be getting access from the workplace. It's arguable that an AR headset like one from ODG or Epson would work the same or better, but the Rufus Cuff is priced much lower at $339. If you feel inclined to check it out for yourself, the Cuff is available for pre-order now and should start shipping soon. Check back then for a longer review of the Rufus Cuff after we've spent more time with it.